I know I JUST posted Week 7’s CSA recipe this week, but I need to catch up. After all, I picked up Week 10’s box Tuesday. I’m sad to say that means only two weeks left. On the other hand, my summer share starts in May. I’m VERY excited to see what wonderful things the Lancaster Farm Fresh farmers grow for me! Carrots–glorious, delicious carrots–were a staple of this winter’s CSA. 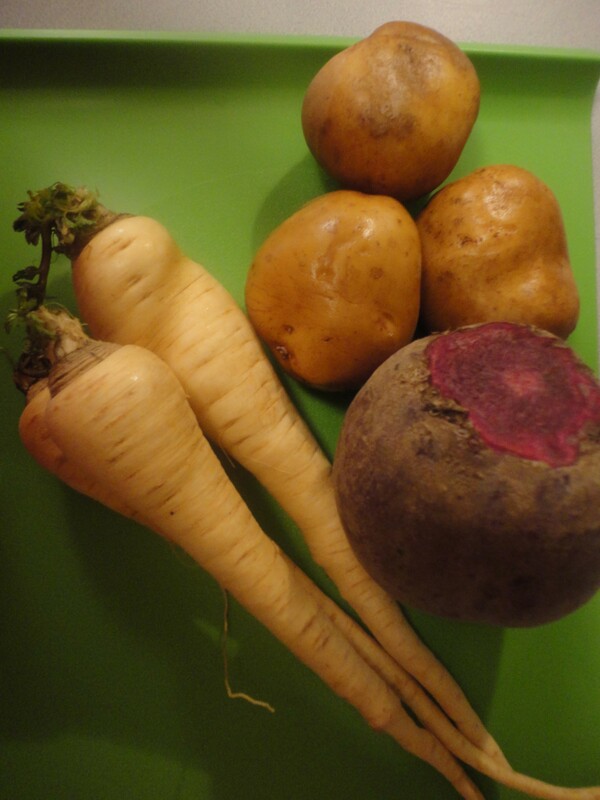 It seems as if they’ve been replaced by their paler twin–parsnips. I love parsnips. I’ve mashed larger, older parsnips with sweet potatoes and topped with goat cheese (so good!). But these parsnips are delicate and tender and perfect for roasting. 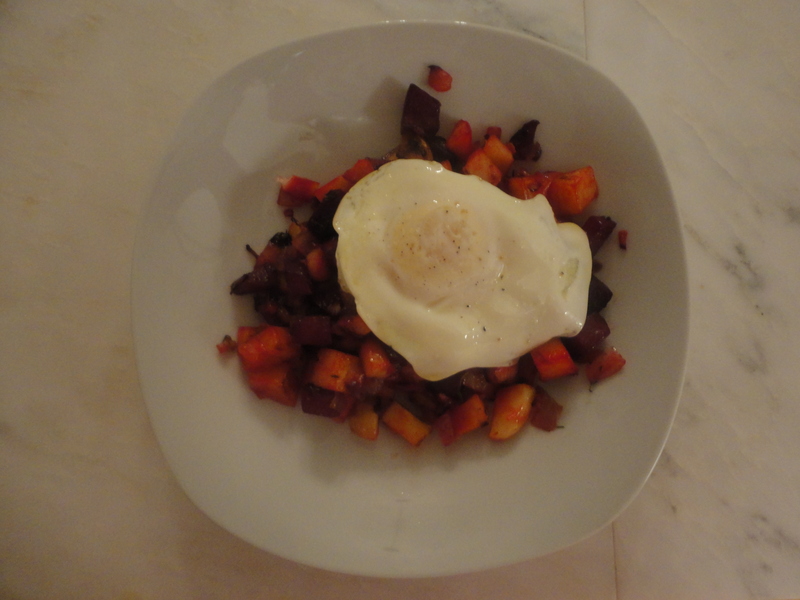 So I took a remarkably large beet (from week 8), a few potatoes, and some parsnips and turned them into hash. Topped with farm fresh eggs, this recipe is a delicious and beautiful way to do breakfast for dinner. I even had leftovers the next morning–dinner for breakfast, I guess? 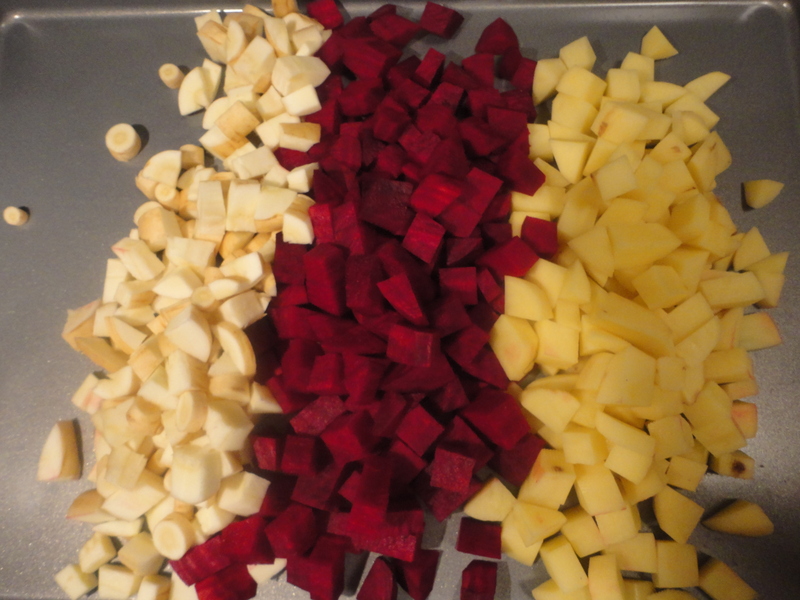 Preheat the oven to 425 degrees F. On a large sheet pan, toss the beets, potatoes, and parsnips with 1/2 teaspoon kosher salt (or more if you like), 1/4 teaspoon pepper, thyme, and 2 tablespoons olive oil. Roast in the oven for about 20 minutes or until tender. Turn with a spatula ten minutes into cooking time. Meanwhile, heat 1 tablespoon olive oil in a large skillet on medium high. Add the onions and saute over medium low until caramelized, about 13 minutes. 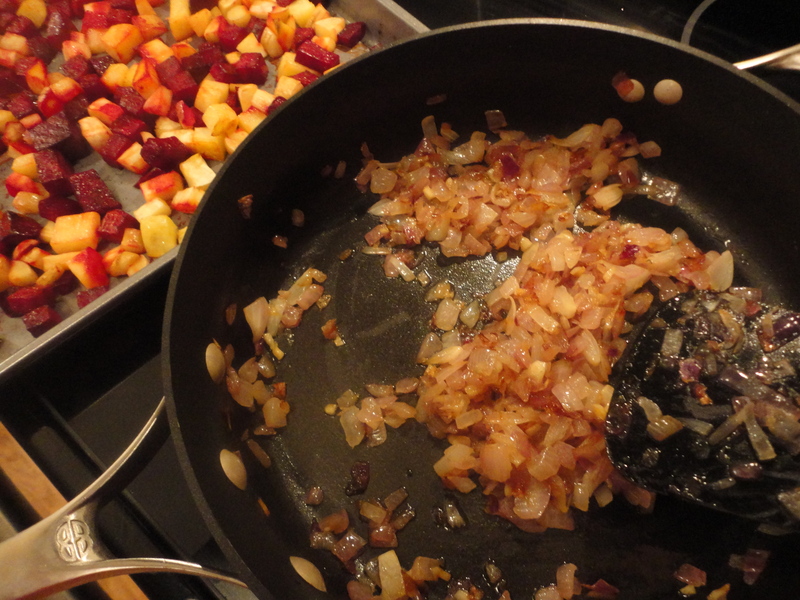 When the beets, potatoes, and parsnips are tender and slightly brown, add them to the onions. Saute until browned even more, about 5 minutes. So tell me, what’s your favorite breakfast for dinner meal? Cold pizza! Also, and this is a Filipino thing – take leftover rice and make garlic fried rice and top w an egg over easy. Ah, fried rice with egg sounds amazing. Nothing better than a runny egg on ANYTHING. I like to think I’ve evolved beyond cold pizza. BUT it’s still one of the most satisfying things to eat. We actually do a breakfast for dinner once every couple of weeks. It is the kids’ favorite meal. The hubs makes french toast, and I make ham and cheese (and spinach, shhhh!) omelets. Sometimes there are hashbrowns (out of a package, we ain’t fancy none), possibly some bacon and/or scrapple, and some fruit and bagels. It’s also nice, because my hubs and I have been doing some form of it for so long (way before kids), we have this little dance we do while we are both cooking our parts of it in the kitchen. It’s nice. NO BACON??? Oh hon, no. Just . . . no. I’m not sure we can be friends anymore. Next you will tell me that you were out of booze, and then it will REALLY be over. Don’t let Jules see. Shhhhh. I’m NEVER out of booze. How DARE you??? Oh hooray for veggies! It will be the season here soon. 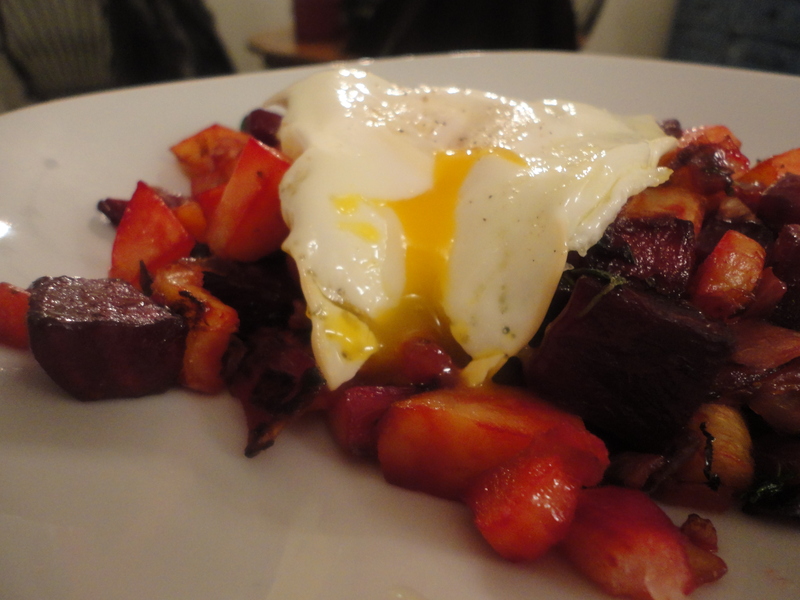 The hash looks yummy–I like beets with anything. Or with nothing. Beets are probably my favorite root vegetable. I love them pickled, roasted, cold, warm, on salads. YUM! Holy yummers! I’m making this! eggs. hands down, eggs are my favorite – fried, boiled or poached. I don’t do scrambled. I don’t enjoy scrambled either, Tammy! Oh MAN that looks good. I was thinking, “Those little cubes are perfect!” right before I read your caption. Favorite breakfast food… well you know lately I’ve been partial to the Trader Joe’s chile-and-cheese tamales with a fried egg, hot sauce and sour cream. But my all time favorite breakfast is anything that features a delicious, buttery creoissant. And great coffee with cream. I really think you’re onto something here with the tamales and the egg. And the sour cream. Brilliant! Coffee is a MUST at breakfast. Looks delish! And a perfect Breakfast for Dinner combo. I am a massive fan of bagels and will have a single-gals dinner of a bagel with the most elaborate topping I can find. Sometimes it’s smoked salmon, cream cheese, capers + dill, but I do love an eggs benedict with a side of asparagus. Wow – I’m hungry now! Smoked salmon is one of my favorite things. It’s great in omelettes with some creme fraiche and dill. YUM! This looks sooo yummy! I’m not really a fan of beets myself, but I would definitely try this. As a vegetarian I’m always looking for new recipes and ways to incorporate more veggies into my diet. I made this without the beets, too–just added more potatoes. So good! Beets are an acquired taste. I could eat them every day and love them pickled.